Ever feel like life just bumps you up and down through highs and lows? Fiona adds perspective. “To Him who is able to keep you from falling and to present you before His glorious presence without fault and with great joy–to the only God our Savior be glory, majesty, power, and authority, through Jesus Christ our Lord, before all ages, now and forevermore! Amen” (Jude 1:24-25). One day I’m optimistic that I’m feeling a bit better, then the next I may be feeling down about the fact that something else is happening, or that things are just not getting better. It’s easy to get bogged down in thoughts like that–bouncing up and falling down, just like a yo-yo does. I guess it might be encouraging that most of the time the yo-yo does come back up again, but I hadn’t thought of that at the time. Then I thought about this photo of me I’d shared with some people. 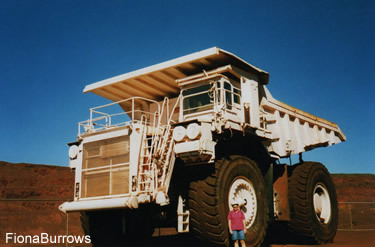 It was taken years ago beside one of the huge mining trucks at an outback mine I’d visited. I recalled their comments on how big the truck was and how tiny I looked beside it. I‘d remarked that despite how big the truck looked beside me, when you see them working deep in the open cut pits, they look like tiny toys from above. Maybe that’s how God sees us–like those huge trucks that seem like tiny toys. This can put perspective on our view of our problems–like my yo-yo. In God’s view our problems are so small–merely a blip, a second, or minute in light of eternity. God’s view of my bouncing yo-yo would be very different to my own view. No-one disputes that living with a chronic illness, or even with someone who has one–is hard. There are plenty of ups and downs along the way. Like the yo-yo in the control of someone’s hand–so God is in control of our ups and downs. He will keep us from falling out of His care. He understands and walks alongside us, through whatever happens. Prayer: Father God, help me and those who read this, to keep our minds on You and the promises you’ve given us, rather than the negative thoughts we can focus on. Thank You that even when life may feel like it’s bouncing around like a yo-yo, You hold us in Your care and keep us from falling. Amen. What’s out of perspective in your view? Are you placing too much importance, or concern over something that may just bounce back–like the yo-yo–in time? Filed Under: Coping Skills, Devotionals, Loneliness, Overwhelmed, What's New? Wow! Thanks for this devotion today. Jude 24 & 25 is what I just memorized and this helped me understand it even better. Today is a down yo-yo day, but I know tomorrow could be up. Thanks for the reminder! Great that this came at a time you were memorising those verses Val 🙂 hope they will be as helpful to you as they’ve been to me – and praying you will keep that positive hope that tomorrow may be a better day, because God promises one day it will. Thanks to you for sharing that Fiona, that was exactly in tune with my thinking as I woke up this morning. These 2 scriptures spoke to me this morning over coffee, “1Co 7:24 Brethren, let every man, wherein he is called, therein abide with God. ” and “1Co 7:20 Let every man abide in the same calling wherein he was called. “And it also made me think of Paul telling how he had learned to be content in all situations. So in that the lord helped me to realize I was where I needed to be here and now (however humble), and not where I felt so incapable of going, and where I had felt I needed to be as a Christian. I pray the Lord richly bless you , and yours. And also to Carol and all the members here of Restministries God bless you, I’m praying for you all.! Thanks Chris – it’s often so hard to be just living in the present, where God has called us to today. So glad that today is only a part of God’s plan for each of us, and that He promises to be with us through each moment. I can certainly empathize with your yo-yo. Thanks Di – I know you’ve had your share of ups and downs lately, but I’m glad you can still see the humour – we have to keep on laughing, but sorry you can identify with the yo-yo :)! I’m so glad “NOTHING is too BIG or too Little for His attention” – He cares so much. This devotional really spoke to me today, as my life really has been like a yo-yo for the past week. Last Tuesday, I had an injection in my cervical spine to help with pain and tingling. And it resulted in a spinal fluid leak and extreme pain. Saturday I rejoiced that the headaches were finally gone, and then on Sunday I woke up with a different kind of headache, which is still with me. I’ve been reading Scripture and writing, to attempt to keep things in perspective. This devotional and the illustration was an encouragement to continue turning things over to the Lord. Barbara, thanks for sharing – I’m sorry it’s been such a difficult week for you, but glad you found some encouragement to keep on placing all the uncertainties and challenges over to the Lord. It seems to be something we have to keep working at remembering to do! Praying this next week will be less like a yo-yo for you. Thanks for this Fiona. My life is also a yo-yo although I hadn’t thought of that analogy. I usually think it’s like a rollercoaster, or a game of Snakes and Ladders. Your idea of using those huge mining trucks [I’ve seen them too] to keep things in perspective is brilliant. I find it also helps to keep things in perspective if I think about the perfectly working body I will have one day when I see Jesus face to face [whatever form that body may take]. The many promises of our future life are what keep me going when this earthly body and I feel at war. Can’t wait! Thanks for your comments Helen – I have written before about my life feeling like a rollercoaster, but hadn’t thought of Snakes & Ladders. It is certainly an interesting journey we are on! What a day that will be when we have those perfect bodies – certainly a promising thought worth holding on to, especially on the really tough days. Praying you can experience more of the “ups” this week. Fiona – what a great devotional. For obvious reasons, I can relate to the “yo-yo” with the constant dizziness and vertigo condition that I live with. But it also is appropriate to the mental ups and downs that can greet me with any day or part of a day and that is more of a changing phenomena. One insight that came to me as I read your thoughts ( and you said how important i tis to let God be in control ) is how we could focus better ( possibly ) if we do think of God as the string guiding us on the “yo-yo” journey – however it comes. It puts Him with us as we take that ride – hanging onto Him for dear life! His Life! So true Lynn – only holding on to Him can we even face the ongoing. changing, challenges. Thanks for all you shared. I guess if you consider the amazing things some people are able to do with the yo-yo on that string (that I often wondered how), it reminds us that God can do amazing things in our lives, even when we don’t know how anything good can come. Praying your yo-yo condition will be less volatile and more still! Thank you Fiona for your encouraging devotional. I can really identify with the yo-yo analogy because for almost five years my pain has been every other day like clockwork with only a few exceptions. Knowing God is allowing this and that He is Sovereign helps to deal with it even though it’s so strange. Thanks for your comment Janet and I’m sorry you identify with the yo-yo analogy too. Unless I could believe God has a plan and He is Sovereign, I think this would be impossible, so SO glad He is. Thinking of Michael W Smith’s song “Sovereign Over Us” that really encourages and speaks to me when I’m struggling. Fiona, I like your yo-yo analogy. I was thinking of how when I used to play with a yo-yo I’d often get the string all tangled up and have to fix it before trying it again. Don’t you think we often “feel” like our lives are tangled like that string? And yet, in truth, our God is in complete control and is keeping our lives on His special path, for His special purpose. This reminds me of the verse that says that He who has begun a good work in us will complete it until the day of Jesus Christ. This encourages me again and again. May we all seek to focus on God’s perspective when our lives fly all over the place. Now I’m singing “He Who Began A Good Work In You” by Steve Green – I love that song and the comfort the verse gives me too. 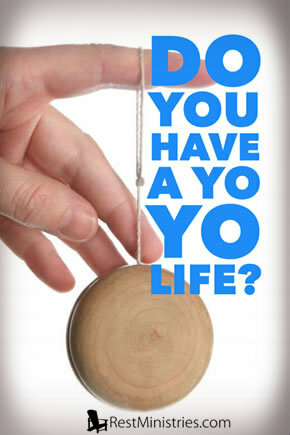 My life is certainly a yo-yo! I often have to cancel plans. I can think this makes me unreliable. When this can actually make me flexible. Flexible to my plans that God can use for His plans. Not that I should be undisciplined, but to take comfort and confidence that God is that much in control and beyond. God does know the plans He has for me. His plans are all better than mine. When I am a yo-yo, I’m not necessarily unreliable. I can chose to be flexible and enjoy the moments in the ups and downs. Thank you! 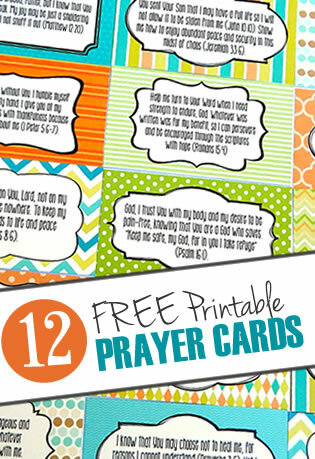 What a great way of putting it “Flexible to my plans that God can use for His plans. ” – we need to allow Him to be in control.